The sheer number of families that have a stay-at-home parent has risen significantly in the past few years. This is partly a result of an influx of the availability of freelance work, as well as work at home jobs, and the like. If you or your partner are considering taking the stay-at-home parent route but are concerned about the best way to make it financially feasible, be aware that it’s possible. However, it may not be particularly easy at first. The best thing about working from home is that you do so on your own terms. 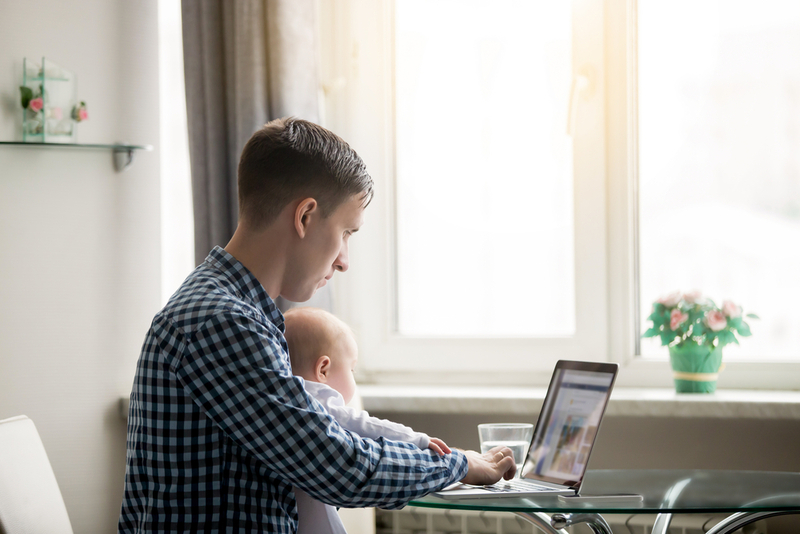 Wherever you are in your stage of your career and parenthood, it is important to sit down and create a timeline of how you plan to move forward with working from home. As you figure out the logistics with your spouse, you will both need to talk about how much money you’ll need to make this stay-at-home parent dream happen. Discuss what expenses need to be cut back, ultimately deciding on how much money you will need regularly when you begin working from home, as well as how your children will fit into the picture. Once you have officially decided that you are going to work from home, paying off any outstanding debt is your next goal. The more money that is paid off, the more freedom you’ll have with the budget as you start off your new career. You may choose to pay off some debts a little at a time, while others you may be able to pay off in one shingle payment. Whichever method you choose to pay off debt should work for you and your budget. Ultimately, it is important for all parents to realize that paying off a few of your bills completely may free up a few dollars every month, which might mean the difference between being able to afford to stay in your home or not. Additionally, it is a good idea to make an effort to not take on any new debt. Do your best to live within your means while working to use any extra income to make sure your bills are paid. You want to do everything you can to avoid having to file for bankruptcy. With no consistent stream of income, this would be a recipe for disaster. Before actually starting to work from home, it is incredibly important that you and your spouse establish a clear budget. This is particularly true if one of you is to be the sole breadwinner for the family. Many new families like to use popular budgeting programs like Mint or Every Dollar, as well as the tried and true method of the Excel spreadsheet. In your budget, you will need to allocate each dollar of your income into a section–say one for entertainment and the other for debt repayment. Many people like to split up their income by using 50% for essentials, 20% for their savings account, and 30% for personal use. As you work on your budget, you will need to find the happy medium that works for both you, your spouse, and your kids. You all deserve a family vacation at least once a year. Consider choosing an adults-only resort or a family-friendly resort if you want to bring the kids along. These options are usually less costly but just as fun. Whatever type of budget you both decide on, you’ll want to make sure it is solid before quitting your current job. Once you quit, you will be in an even more precarious situation as you work to get your new at home career started. As you start off launching your new stay-at-home career, it’s important to research all your options. You may find that one particular kind of job works better than another, and this is likely where you should invest your time and energy. As long as you have planned for the ups and downs that being a stay-at-home parent comes with, you should have enough freedom to earn your money on your terms. It is important for every parent to realize that the work from home experience isn’t the same for everyone. Going from a 9 to 5 office job to being a self-employed freelancer can be nerve-wracking, but with the right timeline, budget, and strategy, you should be set up in no time for your new life working from home.